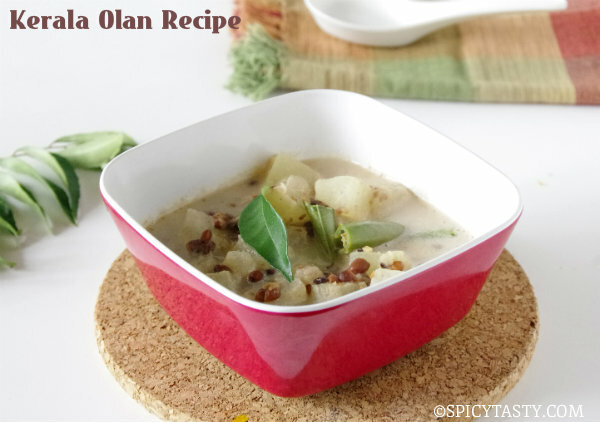 Kasi Halwa is a traditional South Indian dessert made with ash gourd or poosanikkai. 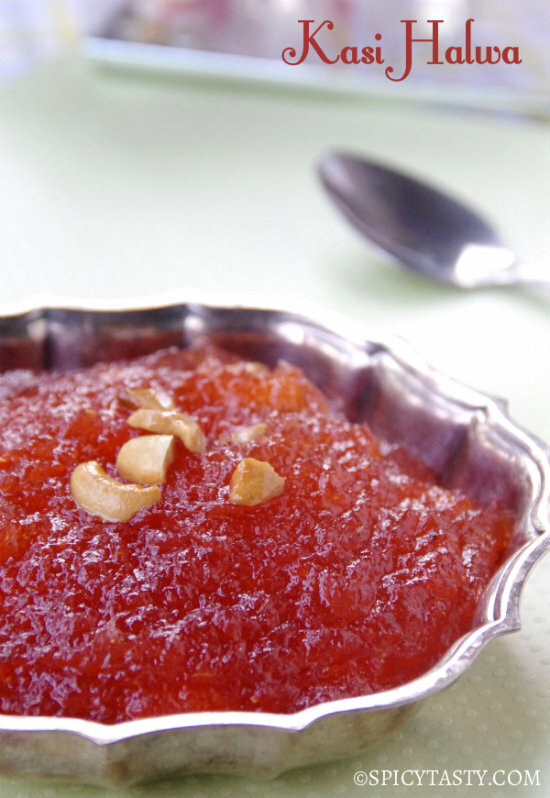 This halwa is served in weddings and special occasions. 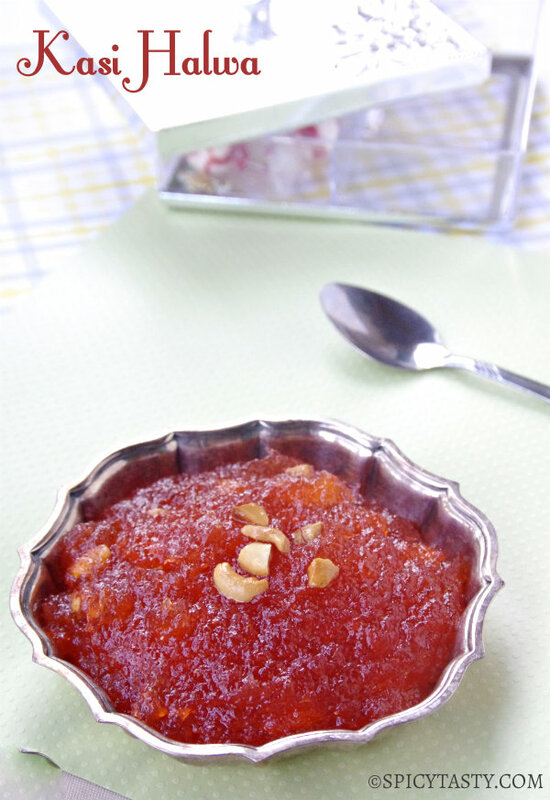 It is one of the most delicious halwa I have eaten and definitely made it to my favorites list. 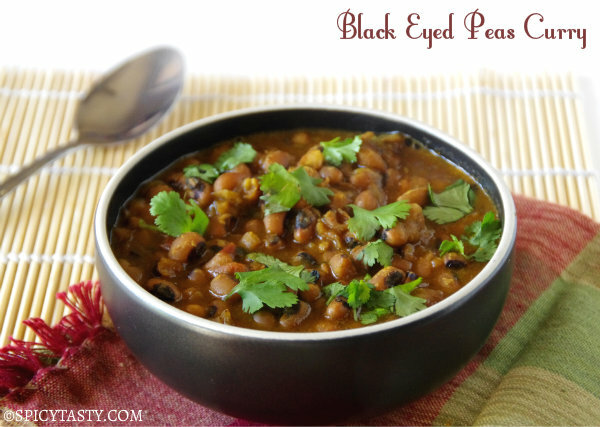 You need very less ghee to make this dish and the ingredients are pretty simple. Only thing is the yield is less compared to the amount of vegetable you use. 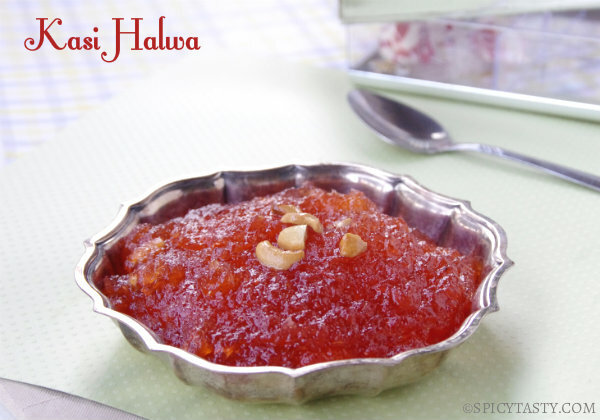 Try this delicious Halwa for this Diwali and enjoy with your family and friends. Peel the skin of ash gourd and shred it. I used my food processor for shredding which made the job easy and no mess. 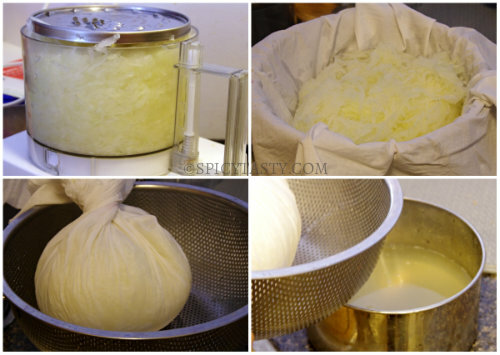 Tie the shredded vegetable in a clean kitchen cloth or a muslin cloth and squeeze the excess liquid. Steam cook the vegetable. I lined the idli plate with a clean cloth and spread the vegetable, covered it with the cloth and steam cooked it for 20 minutes or until cooked. You can boil the vegetable with some water and cook until tender, but steam cooking is faster. You will be able to mash the vegetable easily once it is cooked. Let it cool and again squeeze the excess liquid and measure. I got about 2 and 1/2 cups of cooked vegetable. Based on this we will add sugar. Grind it to a paste. There can be a few chucks here and there. Heat a pan and add sugar with 1 cup of water. Let sugar dissolve and bring it to a boil. When the syrup starts thickening add ground vegetable and mix well. Mix the food color in a few drops of water and add it to the pan and mix well. Keep stirring over medium heat until it starts sticking to the pan. Add a tablespoon of ghee and keep stirring. When it starts leaving the sides of the pan and becomes thick, remove from heat. Do not keep it for a long time over heat since sugar starts crystallizing later. Fry cashew nut in a tablespoon of ghee until golden brown and add it to the prepared halwa along with cardamom powder. Mix well. Grease a store container with a teaspoon of ghee and add the halwa to it along with the remaining ghee. Mix well and cover with a tight lid. This is a very new kind of halwa for me and it looks so inviting and wholesome. Hi Nithu the dish looks very appetizing, I have few questions..
1. Is the ratio of sugar to vegetable 1:1? Thanks Harish. The ratio is for cooked vegetable to sugar and it is 1:1. But it again depends on your taste. So I would suggest you to add 3/4th of the sugar, check for sweetness and then add the remaining. 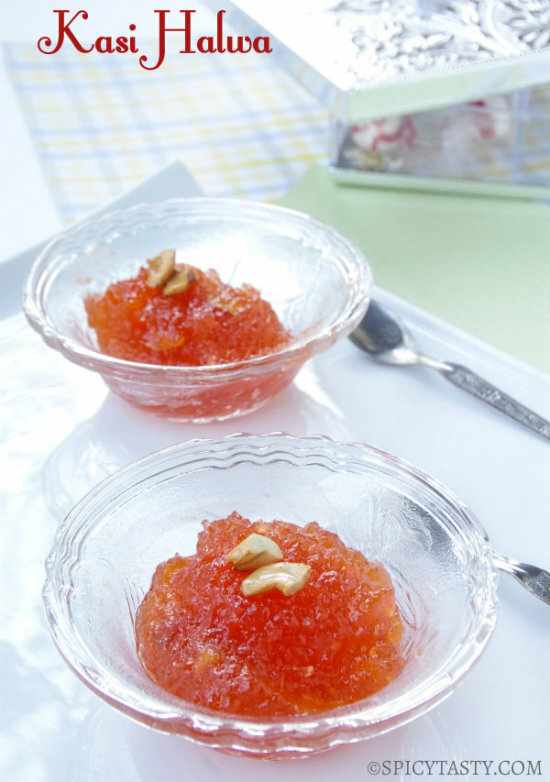 This halwa will solidify and you can cut into squares or any shape.